We love KFC because we love fried chicken. But the batter and deep frying aren't good for any of us watching our weight. Let us tell you......the new KFC Grilled Chicken is really delicious and juicy! 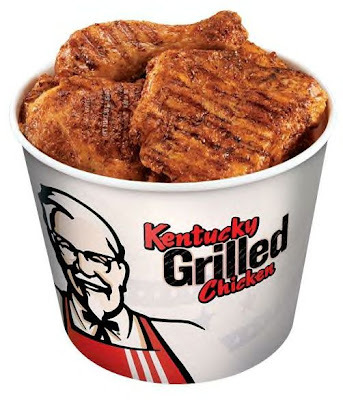 The grilled line by KFC was introduced to the world in April of this year. And we're coming up to the 6 month mark, and trust us, this grilled chicken is a keeper. KFC has gotten the thumbs up for trying to bring fast food to a healthier, dietary level. Well, at least finally, after all these years, the popular eatery is offering their famous chicken grilled. In other words, it's nice to have a choice when you're watching your weight and health. 180 calories and 4 grams of fat for a breast. 140 calories and 9 grams of fat for a thigh. 70 calories and 4 grams of fat for a drumstick. 80 calories and 4 grams of fat for a wing. Zero carbs are in the grilled chicken. And you're getting half the calories of "Original Recipe" and even more of a dietary savings from the calorie-laden "Extra Crispy" and "Hot & Spicy." An Extra Crispy chicken breast has 17 grams of carbohydrates and almost 500 calories compared with 0 grams of carbs and 180 calories with KFC's grilled breast. Get your KFC grill on, because this stuff is also, finger-lick' good! Luv the KFC grilled chicken!! Juicy but also greasy too. Thanks for the calorie breakdown. Had no idea it was only 180 cals. for a breast. Coulda had 2 breasts!